This honeycomb style matte fabric has superior moisture-absorption and quick- drying properties. It is also easy to wash and shrink-resistant. Repels water and utilizes napped mesh material to maintain moisture retention in lining. The jackets are available in three styles: lull-zip, half-zip, and pullover. Features are ordinary water-resistance and water-repel lent finish. Minimum order of five windbreakers. All products include thickly-napped black mesh. 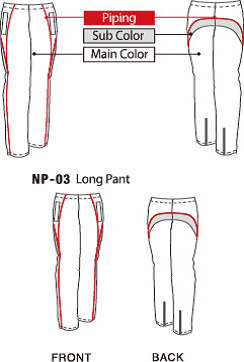 Only PN-03 pullover and NP-03 long pants can be made without lining. Junior sizes is 130- 160 include drawstrings in the pants cuffs. Estimated time from order to delivery is four weeks. Markings require an additional fee.